09 Apr 2019 – In October 2018, Soh Rui Yong alleged that Ashley Liew did not slow down during the 2015 SEA Games marathon race. We responded on 21 Oct 2018 to media queries. In spite of this, Soh continued to maintain his allegations insinuating that Ashley had lied. Following SNOC’s ‘retract and withdraw’ letter to Soh, and Soh’s non-compliance, we responded on 02 Apr 2019 to media queries. We said that we are examining all legal options available to ONEathlete, Ashley Liew in view of these developments. Soh had accused ONEathlete of ‘using personal attacks rather than sticking to facts’ on a Today Sports social media post on 02 April 2019. Despite the availability of sworn statements from witnesses in the form of the Statutory Declarations that were available for Soh’s review upon request, he has decided to ignore them and maintain his allegations against Ashley. In 2015, Soh had won the 2015 SEA Games Marathon Gold. Ashley hung on to finish 8th. In Oct 2018, Soh called himself a champion of the ‘truth’ by calling Ashley a liar. On 26 Oct 2018, Soh reiterated that Ashley was “conjuring, exaggerating, and circulating a fictional tale of sportsmanship … ”, Ashley chose to de-escalate. In Apr 2019, Soh ignored witnesses’ sworn-in statements that contradicted his ‘truth’, and called Ashley a liar, again. In Apr 2019, Soh refused to retract his allegations. He brands himself as the ‘rebel’ who won’t be intimidated and will see this as an opportunity to stick it out and make his point. All this while, Ashley was faced with questions and doubted by many for doing the right thing during the race. In response to suggestions that we provide GPS watch data from the race, unfortunately, Ashley was using a Timex analog (non-GPS watch) during the 2015 SEA Games Marathon, and up till Jan 2018. ONEathlete understands that as of Oct 2018, no video evidence of the 2015 SEA Games Marathon race was available. The event was also not broadcasted. The existence of the statutory declarations containing the accounts of eyewitnesses as to what had transpired during the race is therefore of material significance, since these accounts not only form the best available evidence, but there would be no reason to doubt the credibility and accuracy of these independent, third party accounts given that it is an offence to make a false statement under the Oath and Declarations Act (Cap. 211). Excerpt from 02 Apr 2019: Unlike those whom Soh claims to be his witnesses (such as Philippines athlete, Rafael Roliquit Jr, who had received coaching advice from Soh, as well as, two other individuals who were Soh’s coaches), we understand that these four individuals are independent witnesses who were prepared to and did, in fact, make sworn statements of what they saw during the race.That is the material difference – anyone can say anything you want on social media and get away with untruths and lies, but not so when you make statutory declarations. We disagree with Soh’s suggestion that the witnesses’ statutory declaration lacks credibility. The 4 witnesses’ identities have not been publicly revealed, but they are far from nameless individuals. Soh does not even appear to be interested in who they are of what they have said since he has so far ignored SNOC’s offer to view the statutory declarations. Soh had shifted his stance between Oct 2018 and April 2019. In Oct 2018, Soh definitively alleged that ‘Ashley did not slow down’. But in Apr 2019, he downplayed his allegations and claimed he ‘did not see Ashley slowing down’. The shift, while subtle, is significant and non-accidental. We believe that as a learned individual, Soh is aware of the difference implied in these two statements. “From a personal standpoint, I have not responded publicly to something like this because it is not my nature to fan any controversy. To me, staying silent on the matter was an exercise in de-escalation, not an admission of guilt. Through his lawyer, Mark Teng of That.Legal LLC, Ashley Liew has sent a cease and desist letter requesting, amongst other things, that Soh retracts his statements and make a public apology. It has been a challenging period and the decision, a tough one, for Ashley. However, no one should take his kindness for weakness. ONEathlete supports Ashley’s decision to seek the justice he deserves. We hope that Soh will co-operate with SNOC’s and Ashley’s lawyers, to resolve this matter as amicably as possible and put this unnecessary matter to rest. 02 Apr 2019 – In October 2018, Soh Rui Yong alleged that Ashley Liew did not slow down during the 2015 SEA Games marathon race. We responded on 21 Oct 2018 to media queries. In spite of this, Soh continued to maintain his allegations insinuating that Ashley had lied. Soh’s allegations had unfairly cast doubt over ONEathlete, Ashley Liew’s repute as an individual, working professional and national athlete, as well as, the merit and integrity of nominating Ashley for and eventual award of the Pierre de Coubertin World Fair Play Trophy in 2016. Back then, we decided not to respond further to Soh’s incessant aspersions in kind because we do not stand for, nor identify with, such regrettable behaviour from a fellow athlete. We note that the SNOC has served a lawyer’s letter to Soh to “publicly retract and withdraw” his allegations, in light of sworn statutory declarations made by various individuals who had witnessed Ashley slowing down to allow the other runners to catch up during the race. We are grateful to the SNOC for working through the due processes to follow up with and provide greater clarity on this matter. We are also deeply appreciative of the four honourable individuals who have stepped forward with sworn declarations to stand for what they deeply believe in and know is right. Unlike those whom Soh claims to be his witnesses (such as Philippines athlete, Rafael Roliquit Jr, who had received coaching advice from Soh, as well as, two other individuals who were Soh’s coaches), we understand that these four individuals are independent witnesses who were prepared to and did in fact make sworn statements of what they saw during the race. That is the material difference – anyone can say anything you want on social media and get away with untruths and lies, but not so when you make statutory declarations. Based on media reports, Soh has decided not to retract and withdraw his false allegations against Ashley, and has instead sought to aggravate matters by repeating his allegations in his social media postings. If the truth is really what Soh seeks, we believe the best way to achieve that would be for Soh to co-operate with the SNOC and its lawyers, and to seek clarity with the SNOC in an amicable manner. It is clear that even when confronted with 4 statutory declarations from witnesses whose accounts contradicts Soh’s allegations, Soh has chosen to turn a blind eye to these sworn-in and factual accounts by insisting that his allegations represent “nothing but the truth”. Such an approach by Soh only serves as an aggravating factor to his initial conduct of falsely accusing another athlete of lying, and in so doing, has brought the sport into disrepute. Soh’s refusal to retract his false allegations in the face of the 4 statutory declarations is an extension of his willful act of blatant disregard, poor sportsmanship and improper conduct which goes against Singapore Athletics’ Athlete’s Code of Conduct. will defer to SNOC’s processes that are ongoing at the moment. We will also examine all legal options available to Ashley in light of current developments. 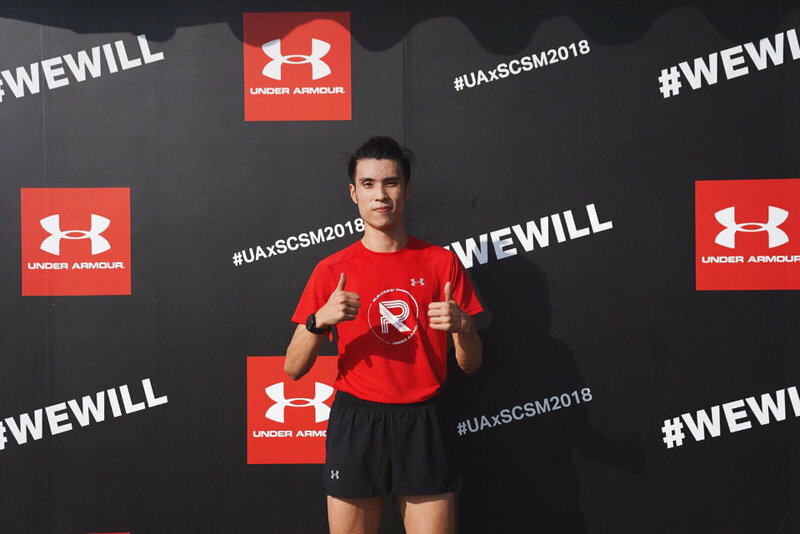 17 March 2019 – Despite earlier scares over a dense haze that had descended upon Seoul and cast race prospects in shrouds, ONEathlete Evan Chee and Ashley Liew, and many other Singaporean runners assembled with great hopes for their season-opening race. First held in 1931, Seoul Marathon is the second oldest in the world after Boston Marathon. The IAAF gold label race is famous for its flat and fast course, with a men’s course record of 2:05:13 set by 4-time winner at this event, Wilson Loyanae of Kenya. Typically held in mid March, the cooling starting conditions of about 4 degrees and 8am start time makes it one of the preferred races for runners looking to lower their personal bests. At this year’s Dong-A Ilbo Seoul International Marathon, Kenya Men and Women dominated as Thomas Kiplagat RONO won the men’s race in 2:05:56 under hazy conditions. While temperatures were near freezing at the start (- 1 degrees Celsius), the cloudless skies and light winds made for otherwise near-perfect conditions to race in. Evan Chee, who finished 4th at the 2018 Standard Chartered Singapore Marathon, crossed the line in 2:41:01 – a new personal best and M35 category Marathon Record (pending Singapore Athletics’ ratification) – while Ashley succumbed to leg fatigue to finish in 3:08:57. The latter eventually managed to join in with the rest at the finish to celebrate his fellow ONEathlete’s achievement. “I’m very happy. It was a fast course and I was fortunate to have good company along the way. Though the haze was a bit annoying, I am pleased with my performance this early in the season and hope to build on this over the next few months” Evan said, adding that he hoped to qualify for the 2019 SEA Games marathon which would be held in Philippines in November. The 38-year old Men’s veteran marathoner was recently nominated to the Singapore National Team (TeamSG) along with his marathoner sister, Yvonne Elizabeth Chee. The seasoned marathoner usually competes in 3 – 4 marathons a year. However, with a relatively short 13 weeks between SCSM and Seoul Marathon, Evan incorporated longer tempo trainings and slightly less mileage. This regular review of training approach based on race results (and experience) has been part of Evan’s repertoire ever since he started running competitively. While it is nearly impossible to get everything perfect at your first attempt, he believes that every race can be seen as an experiment of one that we can learn from and improve. The Adidas Ambassador is currently training under Coach Steven Quek. Also spotted in Seoul: A Team of Singapore Shufflers displaying their racing prowess with a number of them finishing close to the 2 hour 45min mark. Jason Tan who narrowly missed his sub-3 hour timing at SCSM2018 just couple months ago, crossed the line in 2:45:05. His team mate, and young talent Daniel Leow, followed closely behind with a 2:45:43 finish. Other runners prolific in the Singapore running circuit, Andy Neo and Hiroto Ogawa finished in 2:49:01 and 2:50:30 respectively. RunONE’s in-house editor, Lester Tan, or more commonly known by his handle @runningtan, finished with a new personal best of 2:57:16 to join the sub-3 club. But the icing on the cake for Singapore was the new Marathon National Marathon Record as national marathoner Soh Rui Yong finished in 2:23:42. “It took a few years of work and I finally found the race and opportunity to do it, so I’m definitely happy with that,” Soh told The Straits Times. As a IAAF gold label race, Seoul Marathon had delivered on expectations. Although the pre-race registration process was slightly challenging for international runners due to language barriers, the race was well organised, with adequately spaced drink stations serving Pocari and water, as well as full road blockage to ensure the IAAF Gold Label standards were upheld. More than 37,000 took part in the 2019 edition of the race which winds through the streets of Seoul before ending in the Seoul Olympic stadium that played host to the games during the 1988 Summer Olympics. ONE would also like to express its gratitude to The Singapore Embassy in Seoul, Korea and Ambassador Yip for hosting the ONEathlete team earlier this week. What Are Athletes Doing? (WAAD?) Especially when they are not on the track or the courts? Who are they … really? What makes them, who they are? Ashley Liew, the Pierre de Coubertin Trophy Winner, could easily boast of his fat-to-fit inspiring story. But the ONEathlete and Asics Ambassador, exudes humility, and focuses on his profession as a Doctor of Chiropractic, and passion as a National Marathoner. But is that all? In the first part of this athlete(s) feature – the ONEathlete Team followed him a little closer in the month of February – we presents 5 things you need to know about Ashley! He celebrated his 2nd year ‘first-meet-up’ anniversary on 12 February, blushes talking about his valentine’s day date like its the first date, and has his sleeves-rolled for his marriage preparations. 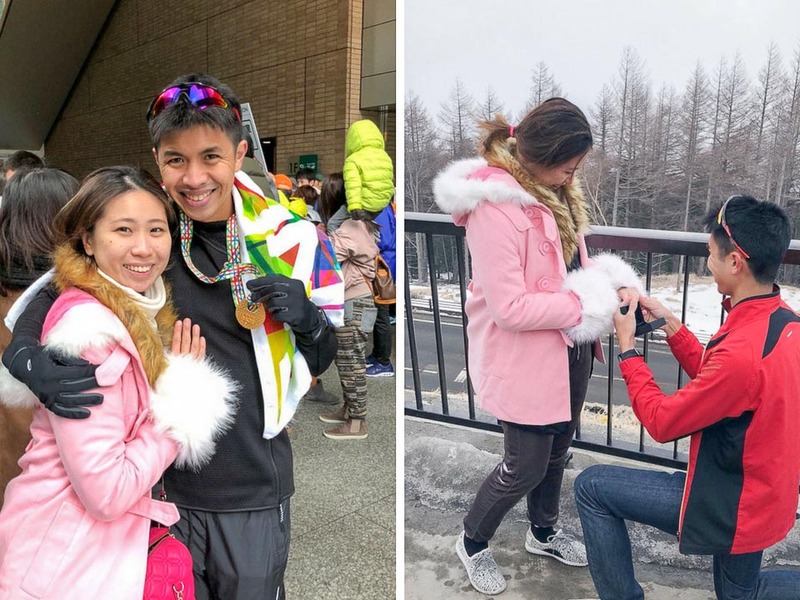 You might have also spotted the equally supportive, ONE’s resident Cheerleading-coach, and soon-to-be Mrs Liew at races. The Odyssey, was organised by The Mentoring Circle (SMU) and held on 15 Feb 2019, the flagship mentoring and networking event was graced by Guest-of-Honour SMU Chairman Mr Ho Kwon Ping. It was also attended by over 400 alumni, students and guests at the SMU Hall. Among the 8 alumni members invited to share over a cushion-breakout-session, were Ho Shyn Yee (Director, Product & Technology, Expedia Group), Leonard Lim (Executive Director, Wealth Management, UBS), Vincent Ha (Co-founder, Gushcloud International) and ONEathlete’s Ashley Liew (Doctor of Chiropractic, Family Health Chiropractic Clinic). Even during that sacred time to share his journey and insight to his clinical profession; he intentionally reminds his audience to discover and pursue their purpose (whys) and interest. He just wanted to sow that tiny little difference in their life. He has dedicated races to his late mum, written moving tribute pieces to his parents, his coaches, and his mentor, Dr Kelvin Ng (Family Health Chiropractic Clinic); which gently reminds us to be reflective too. Oh yes! Have you seen his social media postings? He remembers to credit every photo, acknowledges every support he is a benefactor of, and every person that made that little difference to him. There is usually a list, and we doubt he intends to shorten it. He is thankful that way. His meticulousness was evident in how he coordinated his schedules, or even the talks that he had to give, detailed to even the slides and equipment he would need to conduct the session. Teamed up with the Kampong Runners and Specialist Dental Group to give back through running a relay at 2019 Singapore Cancer Society-TalkMed Relay For Life. It was overnight and many of us wouldn’t mind a snuggle under our blankets at that time. It was also meaningful for Ashley to give back towards the efforts to battle against cancer, as he had to deal with the impact of the illness upon his family, 9 years ago. A man’s character lies not only in his successes, but more so, in his setbacks. Ashley seemed to have a silent word that he holds close to his heart and keeps the daily-grind machines on. One that would also require discipline, resilience and the WHY to keep it going. Then you realize, he wasn’t smoking you but merely sharing, what kept him going. Ashley Liew, will be racing at Seoul Marathon this weekend, together with his ONEathlete Team mates. Join us in wishing him a good race and a great experience! Innovative Sleepwear Line to restore muscle faster when you sleep! This article was first published on runsociety.com on Jan 30, 2019. CHERMENT TAY – What better way to recover from the day of vigorous workout with Under Armour’s latest Recovery Sleepwear line that features the ultimate post-game, post-train advanced sleep system which was designed to help athletes restore muscle faster while the body recovers during rest. Here is an excerpt of the RunSociety article where they interviewed, UA Ambassador and ONEathlete, Banjamin Quek. 1. What category for SCSM 2018 did you participate in? 2. How did you celebrate after finishing the race? Banjamin Quek: I went for a meal at Raffles city with my teammates after the race. We did not hang around for long because we were all worn out after the run. Therefore, getting into very comfortable wear and slipping into my bed is the best way to celebrate after the race for me! Also read: Outfit Of The Week #5: Go For A Gym Workout In Cheerful Pink! 3. Did you immediately go back to training after the conclusion of SCSM 2018? 4. What are some of the challenges that you’ve faced during/after a race? Rest: I usually keep my race days free so that I will be able to rest for the entire day after the race. My legs are really sore, so I prefer staying at home and catching up with my favorite shows. Rest is vital for recovery to avoid injuries or the risk of falling ill.
5. What is your post-marathon recovery routine? 6. How do you feel when wearing Under Armour’s latest Recovery Sleepwear line, and how has it aided you in the recovery process? For FULL article on the Under Armour recovery sleepwear line, please CLICK here. Thanks @runsociety. This article was first published on rockay.com on Dec 30, 2018. Main featured image by Adidas Singapore. DARA MORMILE – The roller coasters we endure in the dating world can sometimes be compared to the twists and turns we confront as runners taking on a new trail or path. We’re excited, cautious, hoping for the best, coping with new conditions and learning how to keep ourselves in control of the situation. Some athletes choose to put training first, as their priority and prefer to make a commitment to running and fit life instead of hunting for and committing to Mrs. or Mr. Right. Others want to include their mates in the sport to some capacity and are able to share their athletic feats with someone who has the same overall health values. Another percentage of us don’t even care if whoever we’re dating isn’t the type to lace up and join us for the long run. For runners who are passionate and committed to training – and want some passion in their love lives too – the hectic whirlwind of the dating world may require a careful balancing act. There are a couple of possibilities on the spectrum – runners who may have met that special someone at a race or running event, or runners who meet and fall in love with mates that have no interest in the sport altogether! In another scenario, maybe you’ve met someone who wasn’t a runner before and you’ve inspired their athletic muse (and vice versa)! But how, exactly, does being a runner affect our ability to meet our match and gauge who our ideal mate would be? For runners who are married with children and have found the gracious balance between sports and personal life, you’re already ahead of the game and you’ve probably mastered dividing and compartmentalizing your time. Those still trying to find love in the midst of sticking to a workout routine – and divide their time while finding a mate – can consider the following points when looking for love. So, what’s great about having a running mate? 3 Feb 2019 – RunONE & ONEathlete celebrated our 2nd year! Both athletes and team members came together to look back on a fulfilling year, as well as look forward toward some of the exciting plans that lie ahead. With Chinese New Year just around the corner, it was only fitting that we started the gathering with a lo-hei. As #ONEturnsTWO, it was touching to notice that the community has grown considerably bigger as athletes are joined by their partners, and as staffing expands. The cosy setting also afforded many opportunities for athletes to mingle and catch up with one another. It was a welcome respite from ‘business as usual’ and allowed us to get to know one another better as individuals, not just the identity consigned by the sport that we do. At times, conversations would drift back towards the sport that we love and dedicate so much of our time to, as we shared our race plans and training woes as well as how we can support or provide advice through trying times and difficult moments. The point was not lost on each of us at ONE – there is so much more to being an athlete than any national record or personal bests can ever represent. Together, we can help each other achieve much more than any individual ever will. Thus, we reaffirmed the spirit of family, community and ONEness. The candid sharing of concerns, challenges, as well as plans and opportunities was loosely structured to create a comfortable environment to review what went well in 2018, and what we could be done better in the year ahead. It was also an opportune moment for many amongst us to give thanks and be grateful for the advice help we have received. The chocolate cake at the end also marked another momentous occasion for the ONE community, as well as the beginning of another chapter together. From all of us at ONE, we wish our readers a happy Chinese New Year in advance, and fellow athletes an exciting and rewarding season ahead! Will you run for hope? If you are keen to be part of the race, click on the link above and wait no longer! 1 Dec 2018 – The final pacer run before the 2018 Standard Chartered Singapore Marathon (#SCSM2018) was on 8th and 9th December 2018 was held in partnership with several partners comprising of Ironman, Under Armour Pacers (from Running Department), and 100PLUS together with their Ambassador, 7-time SCMS Local Champion & ONEathlete, Mok Ying Ren. Before the run, Mok Ying Ren took the stage to answer questions raised by the participants. This was an enthusiastic crowd, asking questions ranging from his pre-race warm-up routine to pacing strategies, to his preferred pre-race breakfast. One of the key topics he shared about was hydration. Hydration is of paramount importance to a successful race. However, he noted that a substantial number of runners visit the medical tent due to overhydration. They have drunk excessive amounts of water, resulting in a condition known as hyponatremia – low sodium levels. This results in them feeling giddy and fatigued, symptoms not unlike dehydration. Mok advised that it is important to drink to the point of thirst and allow our bodies’ natural regulating systems to decide how much we should drink on race day. He also suggested that runners should get used to the isotonic drink (that will be available during the race day) during their training itself. Thankfully, the early morning rain had cleared out just before the morning event started and participants got to enjoy beautiful, cooling weather for most of the run. In this final pacer run, the participants were divided into pacing groups based on their targeted Half marathon and Full marathon timings. Half marathon runners ran 12km while the Full marathon runners ran 15km around iconic Singapore sites such as Marina Bay Sands and Singapore Flyer. Mok Ying Ren started off with the first pacing group before striking it out on his own for the last part of the run. Post run, Mok Ying Ren continued to mingle with the participants as they streamed into the finishing area after their runs and had their complimentary breakfast sets. It was also a great opportunity for the runners to #askmok their questions on hydration, pacing, and even their running gait! The official hydration sponsor of SCMS, 100PLUS Singapore provided the hydration for the morning. There was no lack of hydration both during and after the run. With B Vitamins (B3, B6 & B12), Non-Carbonated 100PLUS ACTIVE is specially designed to facilitate energy production, as well as to aid in after-sports recovery. An apt choice for the pacer run and preps for #SCSM2018. Gears get oiled for BB Blaze 2019! 03 Nov 2018 – “During the training, there were times when I questioned why I had joined Blaze in the first place, when I could have been like my peers who were having less strenuous physical training and who did not need to face the pressure of keeping physically fit.” This is how the then-14 year old Samuel Song from Zhonghua Sec felt during the preparations for BB Blaze 2017! Preparations are key in an adventure race, or for that matter, any race. What more for teenage boys preparing for the adventure-based and mentally and physically challenging #BBblaze2019! RunONE will be joining The Boys’ Brigade Singapore as their Official Training Partner, supporting the preparations for the 400 participants and their trainers during this pivotal stage. You can also expect for the 2019 edition to involve more pre-race and race digitalization, with an extended partnership with ONE. To kick off the preparations, the organizers arranged for a Train-the-Trainers session that was attended by officers and boys from various senior programme companies (CCA units in various secondary schools). The Pierre de Coubertin IFPC Trophy Winner and National Marathoner Ashley Liew shared his experiences with the boys and officers. He started by stating his hope to inspire and went on to share how he has transcended different challenges in life, such as when transforming from fat to fit. Ashley had rushed down from his chiropractic clinic, amidst two weeks of reservist commitments. It is not surprising that the ONEathlete was very enthusiastic about speaking to the boys, as a former BB Boy of the 12I Singapore Company (ACS Independent). He has certainly not forgotten his roots, acknowledging the role of The Boys’ Brigade in shaping who he is today during his self-introduction. After throwing in some awareness of chiropractic and the nervous system, Ashley went on to share tips on running forms, injury prevention, and the importance of a training programme. He also shared how the youths could build up their endurance, strength and conditioning to be at their optimal capacity to blaze the trail, come April 2019!